Unlike novels or movies, video games are an interactive medium where the player's actions drive the story forward. 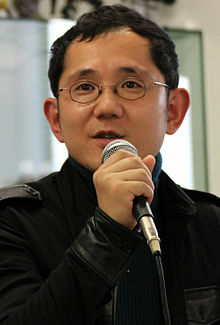 Shu Takumi (巧 舟 Takumi Shū, born May 2, 1971) is a Japanese video game developer working at Capcom who is the main developer of the core Ace Attorney series, serving as director and scriptwriter for the original trilogy. Unlike novels or movies, video games are an interactive medium where the player's actions drive the story forward, so I had actually wanted to allow players to manipulate the evidence themeselves earlier on in the series. I'm pretty sure that was inspired by my experience with the original Resident Evil where I examined a book, and a coin - I think it was a coin? - popped out. As part of the game's promotion, we also collaborated with the Japanese Ministry of Justice, which was preparing for the offical launch of the new system, and gave a presentation of AJ:AA at the ministry's head office. Source:Shu Takumi gives insight about the creation and evolution of Ace Attorney. Nintendowire. Retrieved 2017-11-17. This page was last edited on 16 February 2019, at 14:20.